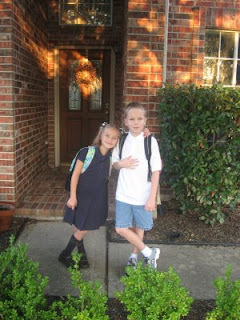 It's the first day of school-- so get your Bryce and Annie fix! Annie at her desk. Yes, a desk-- not a table. She was pretty excited about that! We arrived at the park at around 2pm, and although it's in the desert, it was raining. As we drove west across Texas, the vegetation became much less lush, and the landscape a lot hillier. But the 80 or so mile drive from the freeway to the park didn't seem especially impressive, so I was surprised once we hit the mountains. The Chisos Basin region of the park is gorgeous. We had reservations in a cabin near the park lodge. When I made the reservation a few months ago, I opened the confirmation email to discover that they had accidentally charged me $1500 instead of $150 for a deposit for our two-night stay. I called back, and the guy who took the reservation laughed and said, "Yeah, there's no way anyone would pay $1500 to stay here." Um, ok. Let's say our expectations weren't that high. We told the kids it would be kind of like camping, except we'd have beds. When we arrived at the cabin, I was pleasantly surprised. It was built in the 1940s by the Civilian Conservation Corps and was adorable from the outside-- an adobe cottage with a stone porch overlooking the mountains and a tile roof. Inside it was pretty rustic, but still charming, with a stone floor, a raftered ceiling, and old photographs hanging on the walls. We hiked for a while. Maren, who had a nasty cough and didn't really nap, screamed a lot, tried to walk in every puddle we passed, and attempted to throw herself off of mountains. Then we went to the lodge for dinner. Maren wouldn't sit AT ALL and had to be walked around the lodge for the entire meal to keep her quiet, which was necessary because the only people who eat dinner at 5pm are those with hungry kids and those who are over 75. We were the only ones in the dining room who didn't fit the latter category. After dinner, we returned to the cabin and got Isaac and Maren ready for bed. We put Maren in the crib and she screamed, so loud that we feared she was annoying our neighbors. So Eddie held her on his chest until she fell asleep. The next hour or so was actually really nice. The boys were watching a movie on our 4-inch dvd player (no tv in wilderness cabins, folks), so Annie and I decided to take a walk. First we got some ice cream, then we took several of the hikes that Maren, in her cantankerous state, had prevented us from doing earlier. We returned just after sunset to find Maren and Isaac both sleeping peacefully. Annie and Bryce went to bed soon after. Then Maren woke up. We brought her into bed with us, where instead of settling down again, she perked right up, laughing and talking and being simultaneously cute and annoying. She loved all of the "butterflies" (moths) in the room and kept trying to catch them. She demanded a drink and I got her one. Once she finished it, she started coughing and threw up all over our bed, her blanket, her pajamas and most of the towels the lodge had provided us. We cleaned up the bed as much as we could, put her back in the crib, turned off all the lights, and prayed the neighbors wouldn't complain as she screamed herself back to sleep. It was after 11 before she fell asleep. Night fell. It got windy. The windows were open and the bathroom door kept blowing shut, then rattling loudly. The curtains kept blowing on our heads and creeping us out. It rained. I think Eddie and I probably slept five or six hours between us. When we woke up, it was still dark, but something was making noise. A LOT of noise. I finally put together that it wasn't one of the kids making noise, was not in fact anything human making noise, but thankfully it wasn't a bear either (our cooler was in the cabin with us and I was a little bit afraid of bears, cougars or javelinas going for our cinnamon bread and skim milk). It was a rodent of some sort. We never actually saw it, because we threw one of the (yep, pukey) towels over the garbage can and Eddie tossed it out the back door. And hour or so later Isaac was eating breakfast when he said, "Mom, a mouse just ran in from under Annie and Bryce's bed." Sure enough, a very tame mouse was sitting in the middle of the bedroom floor, looking up at us, and more importantly, our food. We couldn't get it out and tried to coexist. After all, you're not supposed to kill anything inside of a National Park (I will admit to killing a bunch of mosquitos as I sat outside reading, but apparently not enough because my legs are filled with bits). We set out to go hiking, this time right along the Rio Grande river. This part of the park was deserted, and when we got to the first hiking spot, there was a big sign posted that read "Thefts frequently occur in this parking lot." We looked across the river to the Mexican side and could see groups of people on horseback, and decided not to chance it. The next hiking spot was full of bugs. At the third we had to climb under a whole stand of prickery trees to get to the trail head. Maren screamed the whole time we hiked. Annie had a stomachache. It started to rain again. Eddie and I looked at each other and decided not to stay a second night. We rushed back to the cottage, threw all of our stuff in the van, and set back for civilization. Apparently we're not good at roughing it. I'm not sure if we'll surface for church tomorrow. We're all really, really tired (but Annie's stomach started to feel better as soon as she was sure she wouldn't have to sleep with rodents again). Maren is unbelievably cranky. I'm going to let the kids sleep in as long as they want and then we'll see how it goes. Monday is the first day of school-- the return to schedules and order, and after this vacation, I think we need a little bit of R&R. Tonight I walked into the bedroom and tripped over Bryce's Crocs. I know a lot of people hate Crocs, that there are entire websites dedicated to Croc-loathing, and that in a recent Newsweek magazine essay, it's apparently ok to teach your children to make gross generalizations about the fat dorks who wear Crocs. But for me, Crocs represent summer. I make him wear brown loafers to church on Sunday, but other than that, I can probably count on one hand the number of times he's worn anything other than his Crocs all summer. 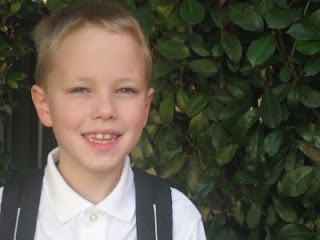 They're outlawed at his school (for good reason, I think), and he has a brand-new pair of New Balance sneakers and another brand-new pair of Lands' End casual shoes sitting in his closet, waiting to be worn next week. 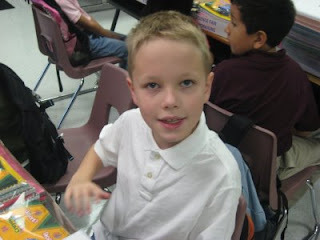 But I'll miss finding his cammo Crocs strewn all over the house (and his sister's bright blue tye-dye ones as well) when he and Annie have to put on real shoes and go back to school next Monday. ...is a lot more than four. I've heard from lots of moms that once you have more than three kids, each additional kid seems not to add significantly to the chaos. I beg to differ. Yesterday, I spent the morning with a friend. We decided to take our kids out to lunch at the new mall, and she wanted to run home to grab an outfit she needed to exchange. She took her toddler with her, I took kept her two older kids and loaded them, along with all of mine, into the minivan to meet her. We had to park a couple of blocks from the restaurant and I felt more like a preschool teacher than a mom, instructing all three girls to hold hands and Bryce to be Isaac's buddy as I strapped Maren in the stroller and paraded all of them down the street. 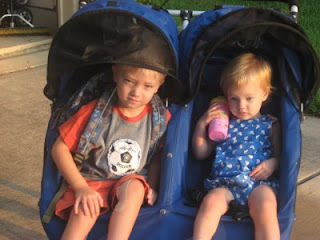 I usually think all eyes are on me as I walk around with my four, but all eyes really were on me as I walked with an eight year-old, two six year-olds, a four year-old, a three year-old and a one year-old. The servers at the restaurant emitted audible gasps when I asked for a table for two adults and seven kids. It was fun, though. 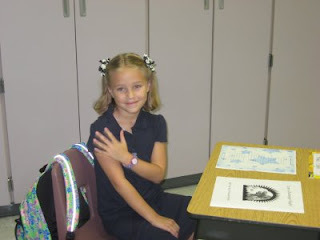 And I've never shied away from the spotlight. Especially when burgers and milkshakes are on the menu. At that point I choked on my garlic bread and had to walk out of the room, leaving him to finish the conversation without reinforcements. Today it was my day to teach Relief Society. Last night I pulled up the lesson on the laptop and did some cut and paste magic (selecting the quotes and questions I wanted to use and putting them in a new document) while I was watching the women's marathon on the Olympics. This morning I woke up early, sat down at the computer desk, printed out my notes, and briefly reviewed them. Then I put the notes in the church bag and didn't think about them again until Relief Society started, when I pulled them out of the bag, set them down somewhere, and stood at the back of the room bouncing a baby while her mother played the piano. When I handed the baby back to her mom so I could teach, the notes were gone. Kaput. So what does a teacher do when she has 25 minutes to fill and no lesson? She laughingly admits her problem to the class, says a quick, silent, fervent prayer, and borrows a lesson manual. Thankfully, the class took pity on me and had a lot to say. It was actually pretty funny, but next time I won't take the lesson out of the bag until it's time to take the stage. The funny thing is that we still haven't found it. Five pages of material, a bunch of cut-up quotes and a chalk and eraser thingy just disappeared.... Maybe it was a test. I'm not sure I passed. Annie and Maren and I went for a Girls' Night Out last night and decided to check out the new mall in town, which opened a few weeks ago while we were on vacation. I've been complaining for three years that we've been living in a retail wasteland, and last night, not five miles from my house, I discovered the existence of Gymboree, Children's Place, Macy's and Coldwater Creek (my mom will be so happy!). There's also a Red Robin, a Potbelly Sandwich place (which Eddie loves) a Pei Wei, and Paciugo, the store that turned me on to gelato several years ago (I've been suffering through life with a pale imitation of the good stuff ever since). Tired of waiting? Us too. But my lips are sealed until the contract is signed, which should happen later this week. Phew. Nine books read in the last few weeks. Nine books blogged. I bought Breaking Dawn yesterday, and told myself that I wouldn't crack it until the blog was updated. Now it is. So if you want me, you know where I'll be. Hiding from the kids in my bedroom, getting my fill of Bella and Edward. The tearjerker of 2008. 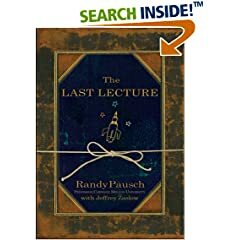 Randy Pausch, a 48 year-old father of three young children, was dying of cancer when he gave a lecture about his life at Carnegie Mellon University, where he taught Computer Science. I've written a lot in the past about how much I hate books by Mitch Albom, so much so that I have a prejudice against any small-format hardcover book. When I found out that The Last Lecture was not only a book written by a dying man but also a small-format hardcover, I decided not to read it. Then Randy Pausch died and I watched the tearjerking Dateline about his life a couple of weeks ago and set aside my prejudices. It was a really good book. 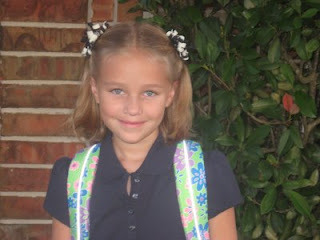 It made me cry, think about how I live my life, and made me want to hug my kids a little bit tighter. Yeah, it was a little bit corny, but it's still worth reading. A man and his son survive an environmental disaster and travel through the wreckage of the American landscape to a more hospitable environment. It definitely took me a while to get into The Road, and even though it's not my kind of book (I hate books where characters have no names, for example), I did like it. McCarthy did a great job of showing both the bleakness of the circumstances and the relationship between the man and his son. 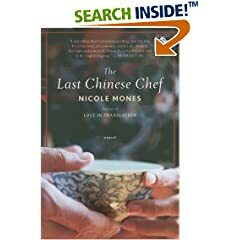 Maggie McElroy travels to China for the twin purposes of investigating a paternity claim against her deceased husband and interviewing an American chef getting to the heart of traditional Chinese cuisine. Wow-- this was a good book. 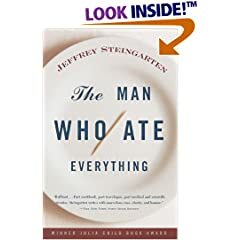 It's everything I like in a book-- it wasn't too long, it was well-written, it talked a lot about food, and it had a great relationship story. I definitely recommend it! A compliation of Jeffrey Steingarten's Vogue magazine food columns from the late 1980s to the mid 1990s. Food writing has changed a lot in the last decade. It's interesting, because Steingarten's work seemed pretty outdated, even though it's not that old. I still enjoyed it, and felt like it did a great job of laying the foundation for books like Heat and all of the stuff by Michael Pollan and Anthony Bourdain. Besides, I also feel like I have a much better understanding for the most curmudgeonly (and most interesting) of the judges on Iron Chef America. David Sedaris writes about his childhood in North Carolina. This book is hysterical. I'm not one for laughing out loud while I read, but I promise that I was upstairs in bed, giggling to myself, practically the whole time I read the book. If you haven't picked it up yet-- read it. 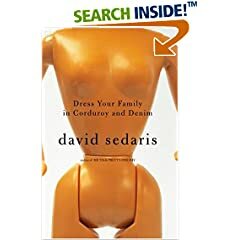 I've now got a whole bunch of other Sedaris books on my to-read list. I think the key when you read is to actually imagine him reading it, in his ever-so-distinctive voice. A woman (based on Dora, a patient of Sigmund Freud) is found murdered in a Vienna park and a police inspector and his wife use two very different methods (scientific and intuitive) to race to solve the crime. My sister had this book several years ago and I loved the cover and wanted to read it. A few weeks ago I bought my own copy and set to reading it. I noticed that it only had two and a half stars from amazon, but was undaunted-- it was exactly the kind of book that I would like. But it was seriously one of the worst books I've ever read. It was SO boring, painful, in fact, to plug through. I think the main problem was the characterizations. I just didn't care at all about the inspector and his wife. They never even gave the inspector as a name, so it made it hard to feel connected with him. And their relationship? So weird. This was a horrible book, although it has a good cover. 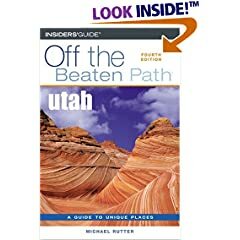 If you like hiking, white-water rafting, and out of the way bed and breakfasts, this is a great guide to Utah. If your interests lean more towards art museums and fine dining, skip it. It's not called "Off the Beaten Path" for nothing. I definitely learned new things about obscure locations in what will likely be our new home, but it's stuff that I'm pretty sure I won't be using every day. Peter Menzel and Faith D'Alusio travel to 30 families in 24 countries, where they photograph the families with their weekly diet and discuss culinary habits in each family and in their countries. I loved Hungry Planet. Smartmama recommended it on her blog a few months ago, and I'd been looking forward to reading it. I've been reading a lot about food lately, and somehow a photograph of a women from Darfur sitting with her five children and a bag of rationed grains juxtaposed with a family from San Antonio and a whole table full of fast food tells the story of how we eat better than all of the books I've read over the last few years. Russ Parsons instructs the world on how to pick and store good produce. Then he gives some recipes for how to prepare it. I've heard a ton of buzz about How to Pick a Peach over the last few months. I've heard Russ Parsons on the radio, railing against such hypocrisies as (gasp!) refrigerating tomatoes and potatoes! 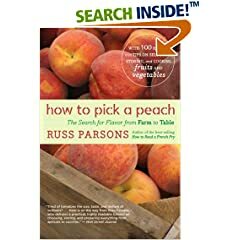 There was a lot of interesting stuff in How to Pick a Peach (particularly the chapter on the two peach growers who pick ripe, rather than rock-hard peaches and have cult following in California farmers' markets). However, I was left with the feeling that having perfect produce is an unattainable goal for most Americans. I went grocery shopping yesterday. The tomatoes were cold, the the broccoli overwatered and browning, and the peaches rock-hard. 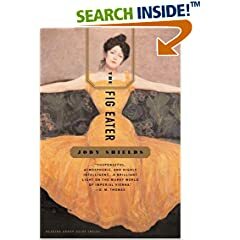 I'd recommend this book to help you feel good about yourself if you live in California and can eat a plethora of great produce in season. Otherwise, skip it-- you might end up too depressed to eat anything but hot fudge sundaes (those are always in season) for a while. I've been nursing along two pots of basil, a pot of mint and a pot of rosemary all summer. When I got back from two weeks in Utah on Thursday night, all four of the plants were totally and completely dead, neglected and unloved. I feel a little bit like my blog has been getting the same treatment. I threw the plants in the garbage. I'm not giving up on the blog, though. I promise, more regular posting is right around the corner. I read a lot on vacation, ran a 5K, did a whole bunch of cool stuff, and helped Eddie make a decision that will determine where we spend the foreseeable future. Want to know where we're moving?